"Christmassy"? Well, the colors are. The books themselves...read the following, then make your judgments. This time, I'll be covering a few Hulk books, and then next time we'll stray off the beaten path and look at some books you don't usually see around here. Everyone ready? First things first: If you're looking for clues to how man was separated from monster, you'll find the first inklings outside of scribe Jason Aaron's preview tale in Fear Itself #7 here. You'll find Aaron touching on Bruce Banner's past with his abusive father, and you'll find a mad scientist can turn a whole lot more than a couple of wild boars into gamma mutates. What you won't find here is any sign that Bruce Banner is anything but a bottom-scraping sonuvabitch. And that, as in the previous issue, is where Aaron really loses this reader. Establishing that the Hulk sees Banner as evil for keeping him locked away inside himself is one thing; showing that Banner's going way, way off the deep end and actually committing--let's not fool ourselves--evil deeds is something altogether different. This issue, artist Marc Silvestri, fresh off a stay in the hospital for an injured ankle, returns to full penciler duties just in time for his grand exit...or does he? Certainly this issue no other artist's work can easily be seen, unlike last issue with Billy Tan and Whilce Portacio all too visible. However, that doesn't mean there weren't other artists making sure Silvestri made his tight deadline. Silvestri himself receives credit for "line art," but his studio, Top Cow, receives a "special thanks" credit (hence my using Silvestri's name in quotes above). It's quite obvious the difference in credits is a direct response to last issue's "monster mash" of eleven credited artists. While the package holds together better than last month, and in places the art is incredibly dynamic, it's definitely best for all concerned that a new and hopefully more reliable artist takes over next issue. As mentioned before, Banner takes his turn at being "Dr. Moreau" further this month, sending his "Boar Brothers" 26 and 27 to the Hulk's recent hideout. A battle ensues, Hulk smashes, and then Amanda Von Doom and her super-secret organization are oh so happy because the battle has made Hulk do exactly what they wanted him to do last month. "Asunder" has felt by-the-numbers in its depiction of both the Hulk and Von Doom. Hulk is at peace, someone comes around to smash it all away, and the Hulk decides to go do some more smashing to smash those who smashed his chance at non-smashiness. The only new thing Aaron and Silvestri offer--and really, "new" isn't the word--is that the Hulk's smashing this time seems to set off seismic waves of force in the surrounding areas. At the very least, the ending of this story makes it clear Aaron is cutting to the heart of the conflict, setting man against monster on a very real playing field. That counts for something, I suppose. I said earlier that this issue does contain a few hints about how the Hulk and Banner came to be separate beings this time. The answer--at least, as I see it--casts some serious doubt on whether that's really Banner we're seeing, with the mania and the unkempt hair and the brain tumor the size of a walnut. It casts equal doubt on whether that's really the Hulk. Aside from the "newborn" allusion, why would both Banner and the Hulk be shaved bald upon their separation? What's more, who would have the technology to separate man from monster--and why would Banner use a lab that seems to be set up in much the same way as the one in which he underwent his supernatural divorce? There's still not enough to recommend this storyline or this new series after this third part of "Asunder." I've outgrown my revulsion at the second chapter, but still, I really think Aaron might be doing irreparable harm to the character of Bruce Banner. (No easy feat for one who has already been established as killing his own father and suffering from lifelong psychological trauma.) 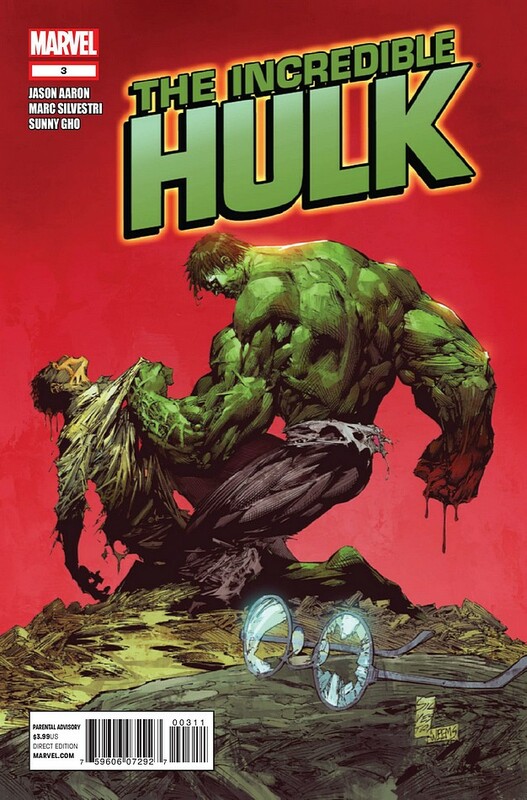 Maybe former Hulk writer Greg Pak bears some of the burden, as this storyline seems to explore some of his dialogue in which Banner postulated the Hulk was created to save the world from his own incredible intellect. Although I believe Pak later expressed through Banner that his idea was only clever tomfoolery, the fact we're now dealing with such a storyline now indicates some people just don't know how to take jokes. This month's pair of issues successfully resolve the five-part "Hulk of Arabia" arc, in which "Thunderbolt" Ross, joined by Machine Man, finally gets to the bottom of Dagan Shah's insidious plans to carve out a niche for himself and his followers in the middle of the desert. Unsurprisingly, the storyline pretty much ends as it was choreographed by Steve Rogers and his merry band of Secret Avengers some issues ago, but Parker and Zircher manage to still pull off some surprises, including Shah's very cosmic origin story. Most interesting are two key details. Parker uses Machine Man's presence to subtly examine Ross' own complex relationship with another artificial lifeform, his Gamma Base liaison Annie. The subtext is there in every question Ross asks, and I can't wait until her next appearance so we can see how ol "Thunderbolt" applies what he's learned. Parker's also made some salient points about Ross' status as a Hulk in this tale, and he has used Shah as his mouthpiece through which to do so. Specifically, Ross does rely on the public perception of who and what a Hulk is. Jeph Loeb used this point without stating it, such as when the Red Hulk only roared as he smashed through the SHIELD Helicarrier so as not to betray his true, strategic aims to Iron Man. Parker has made the point that Ross' hulking form hides his keen strategic mind--a mind which very likely has been sharpened by the mixture of gamma and cosmic rays involved in his mutation. It's this important distinction that separates Ross from Banner. Say what you like about Banner's Hulk: "Strategy" is not a word that involves itself easily. The more I see Patch Zircher's artwork on this book, the more I feel he's right at home drawing monsters smashing things. He's asked to stretch his artistic muscles particularly in #45, with Dagan Shah's unusual origin, and he acquits himself very well. Rachelle Rosenberg matches his pace, using one palette for the more reality-based scenes and another for the otherworldly realms Red Hulk and Machine Man visit as they discover the rest of the story. It goes without saying that I really want to see this team work together again, and soon. "Hulk of Arabia" spices up Parker's series with an international flavor, laying the groundwork for future encounters with Shah and others in the area. 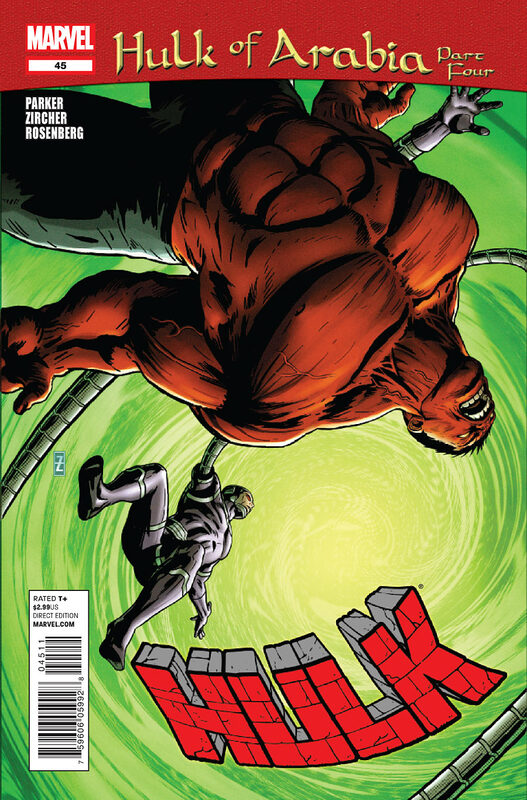 It also marks time by providing yet another encounter between the Red Hulk and General Fortean, and keeps Ross checked in with the other heroes in the Marvel Universe. It's fascinating that while the original Hulk gets more insular, this new Hulk gains vast exposure among the biggest super-heroes. While I still lament the fact there's a Hulk book out there that doesn't feature Robert Bruce Banner, I can't argue that this isn't one fine book month in and out. But yeah, Parker, Up Side, Schwartz, green Hulk, yesterday. Hulk: Season One - The Day the Hulk Turned Green? 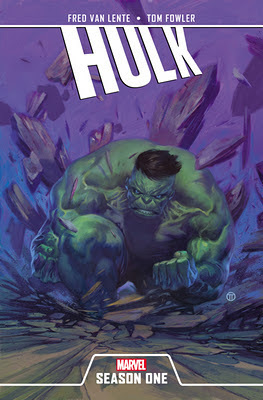 Hulk: Season One, by writer Fred Van Lente, artist Tom Fowler, and color artist Jordie Bellaire. Of course, ol' Fred's no stranger to this blog or to the Hulk, having written some gamma-rific tales in books like Hulk Family: Gamma Genes, Hulk: Broken Worlds, All-New Savage She-Hulk (and accompanying backup tales in Incredible Hulk), and the upcoming Hulk Smash Avengers limited series, among others. He also co-wrote Incredible Hercules with Greg Pak when the Lion of Olympus took over Greenskin's book after World War Hulk. All that hanging around the Gregarious One must've left him with a bad case of the gamma flu, because he's about to unleash over 100 pages of purple-pantsed action in the mighty Marvel manner! You can bet as the release date approaches (it's currently scheduled for August '12) I'll be rounding up more details and maybe even getting the creators to say a few words about this titanic tome! In the meantime, I did want to add some early observations based on everything that's out there so far (mostly a CBR exclusive interview with Van Lente & Fowler). 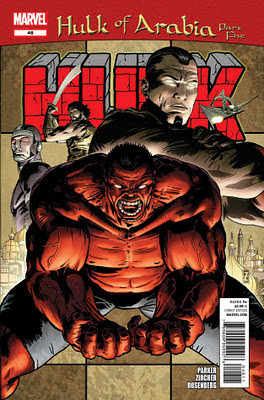 In the interview, Fowler specifically notes that he and Van Lente are working with a different incarnation of the Hulk than in Jeph Loeb and Tim Sale's previous high-profile origin rework, Hulk: Gray: "[W]e're dealing with the gray Hulk who wasn't just talking in three word sentences and saying, 'Smash' and 'Puny' a lot. This was kind of that a-hole Hulk that would often tell people to go to hell." Sounds a lot like the Hulk of Incredible Hulk #1 by Stan and Jack, doesn't it? Point! Van Lente also notes that he's reshuffling a bit of the supporting cast to bring the series more up to date with the times. Particularly, Betty is now "an active member of the military, which sort of reflects how now the U.S. Military more actively recruits women and how they have a more active role in the military now than they did in the '60s." Additionally, Betty won't be the only woman in Bruce Banner's life, as the story "reintroduces a character that I created who has been directly associated with Bruce Banner in a romantic way by other writers. I'm now officially retconning her into Hulk continuity, and she plays a major role in the story. Basically, I thought Betty needed a romantic rival for Bruce's affections and that's this character." Sounds like Monica Rappaccini, AIM Scientist Supreme and mother to the new Scorpion, will be front and center. But what about the bad guys? There's no word yet on whether the Gargoyle will play a role in this revised origin tale, but I'd be surprised if he weren't there in some fashion, Cold War or no. However, Van Lente's assertion we'll see "a very well known evil Marvel organization" speaks well to AIM's involvement since Monica will be around. The writer's also promised "a brand new Hulk villain called Biocide, who's pretty awful and horrible, and therefore awesome." My last tease? 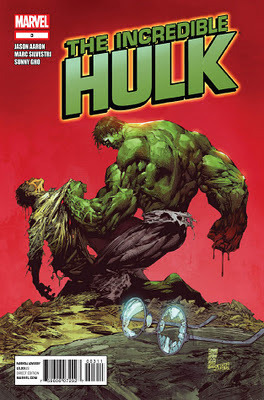 Well, you've seen the cover to the book, and Julian Totino Tedesco's illustration clearly shows a green-skinned monster. On the other hand, Tom Fowler's mentioned that he's drawing a gray-skinned behemoth. Might we finally see the moment Hulk fans have waited five decades for? We know that sometime between Incredible Hulk #1 and 2, the Hulk turned from gray to green. Aside from a way-too-brief scene in Uncanny Origins #5, we've never seen how that color change occurred. Something tells me that if Fred Van Lente's involved, he won't give us a mere throwaway scene and that the shift from gray to green will be a pivotal moment in the narrative. Alas, the answers are many months away. I'll follow up at some point next year, but for now, feel free to visit the above links, as well as those to Tom Fowler's blog, where he's sculpted some Hulk and General Ross heads for reference for this original graphic novel! Greetings, gents. Due to illness--and developments with my "real job"--and yeah, there's that book I've begun writing--I haven't been around to post any reviews! It's about time I got back to it, here, and that means reviewing not one, but two new books by one of Marvel's best & brightest. As everyone knows, although I'm a "Hulk guy" at heart, that's never stopped me from picking up countless other Marvel books, plus DC books, Image, and some other indie press publications. Send me something (at delusionalhonesty [at] gmail [dot] com) and I'll do my level best to review it in a timely manner. That brings us to a series I haven't picked up in quite some time, since just after the departure of Buffy and Angel writer Joss Whedon. Yes, kids, it's Astonishing X-Men #44. Caveat lector: I have been well-read on those mutant folk. At one time, I had an X-collection the envy of most X-fans. Full run of Uncanny X-Men if you include the first four Essential volumes? Check. Full runs of X-Men, New Mutants, X-Force, Cable, Wolverine, and a gajillion other series, regular and limited? Check. About the only series I didn't own that was X-related was Deadpool. But, aside from Peter David's X-Factor, they lost me when the X-folk relocated to San Francisco. And I even drifted away from X-Factor some time ago. For me, X-Men was a light that burned bright, borne from looking at far too many long boxes of quarter books, and then extinguished itself rather quickly. As part of "Regenesis," the latest rebranding of the X-Men titles, writer Greg Pak and artist Mike McKone have come aboard Astonishing X-Men to tell a three-part tale. The creative shuffle is the latest in a long line for the book, which since Whedon's departure has been a showcase for Marvel's most popular talent--or at the very least, writers itching to tell an X-tale they can't fit anywhere else on the schedule. And what of "Exalted," the storyline that begins here in this issue? It's...well, an intriguing puzzle, so far. Scott Summers, the mutant called Cyclops, has been recovering from injuries incurred recently. He remains at Utopia, the San Francisco Bay area base of the X-Men, while the half of the team headed by Wolverine left to reopen the old Westchester school. Physically, he's fit; however, mentally is another story, as he demonstrates by using his optic blasts to decimate the facility's locker room. And then, Storm shows up--looking exactly as she did in the Claremont/Windsor-Smith era of the eighties, white mohawk and all. A glorious battle ensues, unique for its depiction of Cyclops' abilities...and then, as they go together toward parts unknown, that's when the weird gets weirder. It's interesting that Pak and artist McKone go for the nostalgia value of a mohawked Storm as an entry point into this storyline, and then up the ante with the provocative cover image. Fans who weren't around in the eighties may be intrigued, and I hope they are, because Storm's change in appearance is only the gateway into the storyline set to unfold. The script charges full-steam ahead, never really stopping to let you breathe, a feeling only exacerbated by McKone's clean storytelling and topped off with Rachelle Rosenberg's exciting palette of colors. I'm increasingly intrigued by the world into which Cyclops & co. are dropped in Astonishing X-Men #44. It's true, some fans may feel a bit flummoxed, especially those who haven't followed the merry mutants' adventures in some time. Still, I've always liked the stoic Scott Summers, and to follow him through an unusual adventure in the spirit of Judd Winick's Exiles is something of a treat. While by no means perfect--the ending is no doubt disorienting--"Exalted" is off to a good start. Read It. 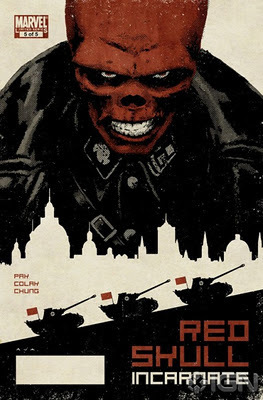 As for the other book on this week's delayed-review list, Red Skull: Incarnate #5, it wraps up the origin of Johann Schmidt, the Rote Schädel (that's "Red Skull" to the non-German-speakers) with the same frightening flourish as writer Greg Pak concluded the origin of the villain who could be seen as the Skull's opposite in Magneto: Testament a few years prior. Pak, this time joined by artist Mirko Colak, brings the tale of Schmidt full circle with--ironically enough--a plot to kill Hitler when he comes to discipline Ernst Röhm at a Munich hotel. Schmidt, his friend Dieter in tow, constructs a simple plan and goes through the motions, chillingly, to get that which he feels he deserves. The plot is an exercise in cold calculation, a hallmark of the later Red Skull. What's most incredible about this final adventure is how it's all based in stark reality--as has the entire series been--with no masks, no costumes, only human beings carrying out their own cultivated evil designs. The minimalist script, together with the low-key, yet no less powerful artwork by Colak and colorist Matthew Wilson, really brings a powerful close to the Skull's first adventure. If you haven't picked up this book in the single issues--if this review gets you on board only too late--then do yourself a big favor and pre-order the graphic novel collection of this series. If you've been following all along or you just want a taste of the Skull's evil unfettered by Captain America, then I have two words about Red Skull: Incarnate #5: Buy It. 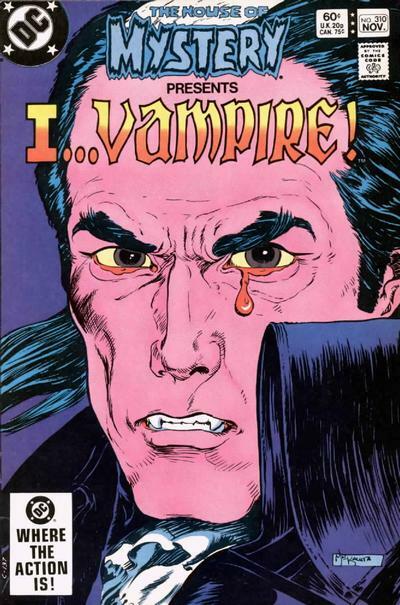 Tears of Blood: DeMatteis, Mishkin & Cohn Remember "I...Vampire!" Do you dare enter...The House of Mystery? That's what every cover of the famed DC Comics horror anthology begged you to answer. Behind covers by luminaries like Neal Adams, Joe Kubert and Michael Wm. Kaluta, the caretaker of the House, a bespectacled, wild-haired man named Cain, entreated fans to spooky stories. Following in the tradition of previous features like "Dial H for Hero" and "Martian Manhunter," neophyte DC scripter J.M. 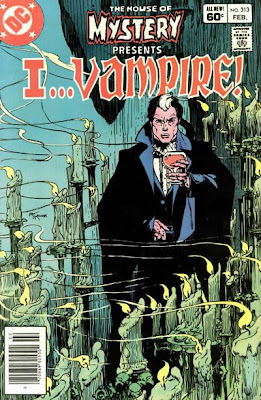 DeMatteis and veteran artist Tom Sutton brought a new regular series-within-a-series to Cain's House under editor Len Wein, a series that now lives again in DC's "New 52": "I...Vampire!" Now that Joshua Hale Fialkov, Andrea Sorrentino and Jenny Frison have produced three issues of the new I, Vampire (which I hope all of you are reading! ), it's time to take a trip back to 1981 with three of the creative minds behind the series' original incarnation: original series co-creator J.M. DeMatteis (also of Spider-Man, Moonshadow and Brooklyn Dreams fame, among countless others) and series finale co-writers Dan Mishkin & Gary Cohn (also known for the much-beloved Amethyst: Princess of Gemworld and Blue Devil). 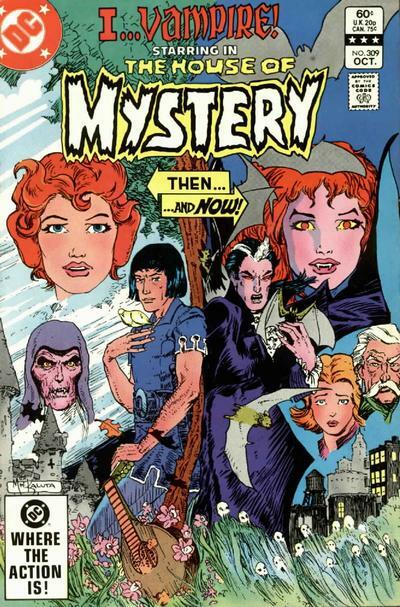 You'll also see some comments from me on the overall direction of the series, which appeared in The House of Mystery #290-291, 293, 295, 297, 299 and 302-319. Mike Kaluta's stunning covers are still enticing today. Around the creation of "I...Vampire" superhero books were the most popular genre in American comics (and remain so today). According to DeMatteis, "When I broke into comics in the late 70's, the 'mystery books,' as they called the horror anthologies, were like the vaudeville of comics. A place for new writers to learn their craft, try, fail, grow, without a lot of attention on them. I sold my first script to [DC editor] Paul Levitz, then started working with Jack Harris and Len Wein. Len became more than an editor, he became my mentor, the first person in the business who made me feel as if I had something unique to offer." DeMatteis set out to prove his craft when Wein assumed control of the horror titles. "Len wanted to inject some ongoing series into Weird War Tales and House of Mystery and asked me for ideas. I'd already had "Creature Commandos" rattling around in my brain and we set that up for Weird War [introduced in issue #93 with artist Pat Broderick], then Len tossed out a title to me—'I...Vampire'—and told me to go home and come up with a concept. That's just what I did, Len loved it, and we were off and running." When it came to artistic talent, Wein cast his eye toward veteran horror illustrator Tom Sutton, whose previous claims to fame included being Vampirella's first artist in 1969 and drawing various horror series for Warren, Marvel and DC throughout the seventies. DeMatteis remembers: "I'm pretty sure Tom was Len's choice; but I was a huge fan of [his] work. He'd illustrated some stories I'd done for the DC science-fiction anthologies and his style was unique, moody, idiosyncratic, emotional. I loved everything he did with 'I...Vampire.'" 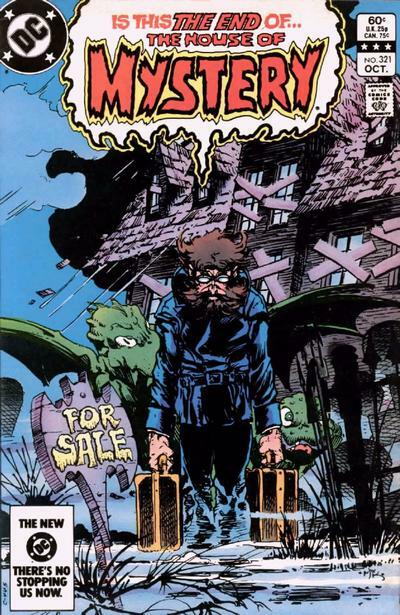 Indeed, Sutton would remain on the series long after DeMatteis' departure, either as sole artist or inker over talents Paris Cullins and Adrian Gonzales, even drawing the series' finale. 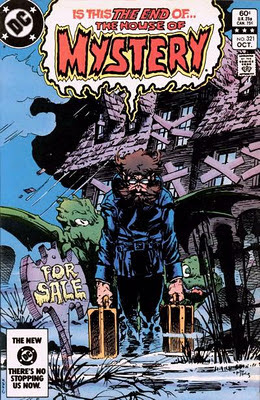 Joe Kubert established the proper horrific mood with the first issue's cover. 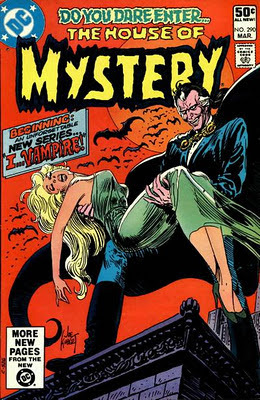 The first "I...Vampire" story appeared in The House of Mystery #290 (March 1981), a few months after the debut of "Creature Commandos" and a month after DeMatteis' Marvel debut (Defenders #92). All the familiar elements of the series are in place at once: Andrew Bennett was the reluctant vampire who made his lover Mary into a less-reluctant creature of the night. To aid him in his quest to stop her Andrew recruited Dmitri Mishkin and Deborah Dancer, two humans terrorized by vampires. DeMatteis' inspiration for the series' characters? "It's been a very long time, but my sense is that I started writing and the characters just came together. I know I was drawn to the idea of a vampire who wasn't corrupted by the curse, that it worked as a wonderful metaphor for the struggles we have in our lives, the darkness in our souls that we wrestle with, and the desire to live good and decent lives despite that darkness." The vampire-as-heroic-protagonist idea was certainly less prevalent in the age of "I...Vampire" than today, where characters like Angel (of Joss Whedon's Buffy and his own eponymous series), Stefan Salvatore (of The Vampire Diaries) and Edward Cullen (of the Twilight novels and films) have caught the public's imagination. Like those latter-day vampire tales, "I...Vampire" also had a provocative, if twisted, love story at its center. "Of course the heart and soul of the story was the Andrew-Mary relationship," says DeMatteis. "Here was this woman Bennett loved, adored, worshipped—and the one time he allowed his vampiric hunger to overtake him, he transformed her into something twisted and evil. And he'd lived with that guilt and shame for hundreds of years. In the end, it wasn't enough for him to redeem himself, he had to redeem Mary, as well. In fact, Bennett was far less concerned with his own salvation than with Mary's. He wanted to oppose her and her forces—but, in the end, he opposed her in order to save her." Andrew Bennett weeps tears of blood for his beloved Mary. Kaluta art. Of special note to fans of DeMatteis' work is the character of Dmitri Mishkin, Bennett's male companion throughout the years: "I...recall loving the character...especially once I wrote his back story, explaining how he'd been with Bennett since he was a little boy. It made the character both more heroic and more tragic. (Mishkin was also Russian, so I was able to express my love of Russian literature, specifically my literary hero Dostoyevksy, through the character.)" DeMatteis made his love for the character manifest in issue #295, which explained Mishkin's origins and revealed that his mother had become a vampire when he was a child, a plot point that would be developed much later. As for the final protagonist, the lovely redheaded Deborah Dancer: "[She], I think, was an attempt to inject someone younger and more contemporary into the mix," says DeMatteis. Bennett and Deborah definitely shared romantic feelings but dared not openly express them—due, no doubt, to his fear of making her another monster like Mary in a moment of passion and weakness—again, a point worth mining at another time. Andrew Bennett only made one appearance outside HoM, and this was it. Jim Aparo art. Bennett had his work cut out for him as a lone vampire allied with two humans against Mary, Queen of Blood and her legion of followers, the Cult of the Blood Red Moon. Whereas Bennett, Deborah and Mishkin were three, the cult consisted of many, often hiding in plain sight among the throngs of humans, ready to pounce, to overwhelm the triad who appeared to be all that stood in the way of their bloody conquest of the Earth. 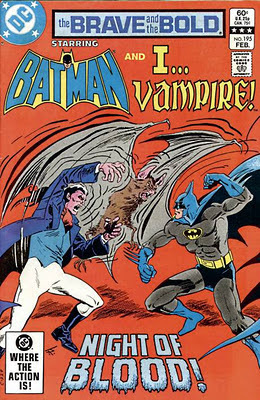 Unlike the latter-day incarnation of the series, the early "I...Vampire" had no elements that directly linked it with the greater DC Universe; in fact, Bennett's only contact with a "superhero," the ever-popular Batman, occurred in another title, the team-up series The Brave and the Bold (#195, February 1983), months before both series' end. Unfortunately for fans of the series, like Don Corleone, Marvel Comics gave DeMatteis an offer he couldn't refuse in late 1981. "[They] offered me an exclusive contract, so that was the end of my involvement with DC for five or six years." To fill the noticeable void, new editor Karen Berger, who later went on to develop the company's eighties and nineties output into the juggernaut Vertigo line, tapped writer Bruce Jones, who spent much of the seventies on Warren Publishing's Creepy and Eerie magazines. Jones picked up the series with issue #299 and immediately set Bennett apart from his friends Mishkin and Deborah following an adventure where he nearly killed them both. The series became like a vampire version of The Fugitive, with Bennett wandering from town to town, encountering Mary's minions and dispatching them. The unfortunate centerpiece of Jones' tenure was a multi-part storyline wherein Mary convinced Bennett to use a pair of ancient rings to transport them through time following the development of a vaccine against cancer which made toxic the blood of those who took it. It's difficult to see how Bennett would find Mary's aims anything but transparent (to travel back in time and kill the ancestors of the cancer cure's developer), but he does, and his naïveté nearly proved the series' downfall. What was once a series with incredible pathos instead became a ridiculous exercise in time-travel involving a visit with Deborah Dancer when she was a child and a cat-and-mouse game played between human and vampire pairs of Bennett and Mary during the period before both were transformed. Bruce Jones' storyline became mired down in too many fantasy elements. Kaluta cover. Leaving before the conclusion of the time-travel storyline, Jones was replaced in issue #310 by another pair of writers new to DC. Dan Mishkin and Gary Cohn came aboard and immediately underplayed the series' more fantastical elements, returning to DeMatteis' tragic take. According to Mishkin: "We’d been doing a bunch of work for Karen Berger in House of Mystery and for some of the other anthology titles...I assume we came to mind because we were right there on hand. I think that our being in the same generation of younger writers probably influenced her decision as well." The series was less something Mishkin & Cohn sought out, and more a chance to prove they could work on a regular monthly book. "We were novices, and the opportunity to work in a series format, which is the meat of monthly comics, was something we jumped at. And there's a definite appeal to doing genre work, where you have lots of conventions that you're expected to follow, but readers are always hoping you'll defy convention in a way that surprises and delights them while still providing the satisfaction of conforming to them. That balancing act of working within the constraints of a genre while at the same time challenging them was something we ended up doing pretty well in Blue Devil. With 'I...Vampire,' we were learning the ropes." Mishkin was attracted to the possibilities offered by the horror genre. "I'm generally attracted to stories that delve into the unreal and impossible, like any other genre geek. The idea of the vampire's sensuality and magnetic personality (of which Dracula is the ur-text), and how that works to break down our conventional notions of morality, is one I've always found fascinating." To that end, he and Cohn returned to the core conflict between Bennett and Mary as well as returning Deborah and Mishkin to central roles in the narrative. 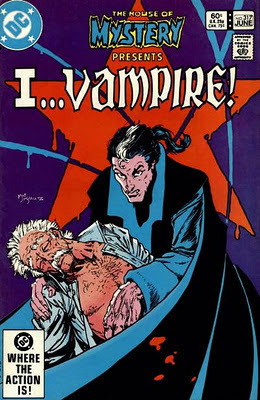 Once again raising the cancer vaccine plotline (whose resolution had been interrupted in Jones' time-travel arc), they established that the cure was a facade, and that the lab responsible was headed by a vampire who wanted to eliminate his kin from the world by seeding human blood with the poison. Mary's people found a cure for the toxin at the lab, shared it with Bennett, and the plague was ended. By this time, the series' sales figures had slumped beyond redemption, and DC's other horror and science fiction series had faded away. The House of Mystery wasn't long for the world. "With that book coming to end, we were told to wrap up the Andrew Bennett saga, and to do it with no loose ends and with a finality that would leave no chance of bringing the character back (a dictate that seems awfully naïve in retrospect)." The series' finale ramped up with the return of Mishkin's mother Dunya, who per the wishes of her mistress, Mary, insinuated herself with Rev. Edgar Warnock of the American Crusade, actually a vampire working to carry the Blood Red Moon's power to the highest position in the land. Warnock was defeated but Dunya kidnapped Mishkin and turned him into a vampire and they fled to Russia. Bennett and Deborah, in pursuit, found out through vampires who'd infiltrated the KGB that Soviet scientists had developed a substance to eliminate vampires' need to avoid sunlight and their lust for blood—a key point toward the series' end. Mishkin's death, depicted by Kaluta. In the series' 317th issue, Dmitri Mishkin met his end, sacrificing himself so he alone could kill his own mother and thereby save his friends. Dan Mishkin, the series' co-writer (but not, strictly speaking, Dmitri's namesake), found the character's death particularly memorable for the behind-the-scenes events. "It was always a little funny writing a character (not invented by me) who shared my first initial and last name, and when we came to his death, I was amused by the thought of seeing a beautiful Mike Kaluta cover that featured a headstone with the legend "Rest in Peace D. Mishkin." But when I suggested it to Karen Berger, she declined out of a superstitious concern for my well-being. Which was really quite sweet, looking back, though I would have loved to have been able to buy the original art from Mike." After Mishkin's death, two issues remained, during which Bennett decided to gamble with his un-life and imbibe the substance the Russians developed. While he seemed fine at first, able to tolerate the Sun's rays and survive without the need for blood, he soon discovered its unfortunate side-effects. Having become a vampire several centuries earlier, he found that the return of his humanity also brought rigor mortis, making him a prisoner in his own body. Upon their final confrontation with the Blood Red Moon, Deborah took the formula before encountering Mary, and when the Queen of Blood bit her, she instead became a new breed of vampire with all the immunities the substance provided. So empowered, she brought Mary into the Sun and killed her before saying a final farewell to Bennett, who scattered into ashes as Deborah wept tears of blood for him, the man she loved. It was an unusual finale to the series, empowering Bennett's human love and having her be the one to end the conflict in the fallen protagonist's stead. The writers called the finale their favorite moment on the series. "Though it’s sad to leave behind characters that you’ve become invested in (also to leave behind a regular paycheck), there's a way in which wrapping up a series was as gratifying as the original opportunity to shepherd one. So much of monthly comics involves keeping the pot boiling that it's easy to get in a rut that's as unpleasant for the creators as it is for the readers. With the chance to do a big finish, we probably turned out our best work on the series—although, given the previous comments about being novices and learning the ropes, and the overall quality that that produced, calling something our best work in this context might not be saying much." Bennett finally met his end with issue #319. Art by Kaluta. 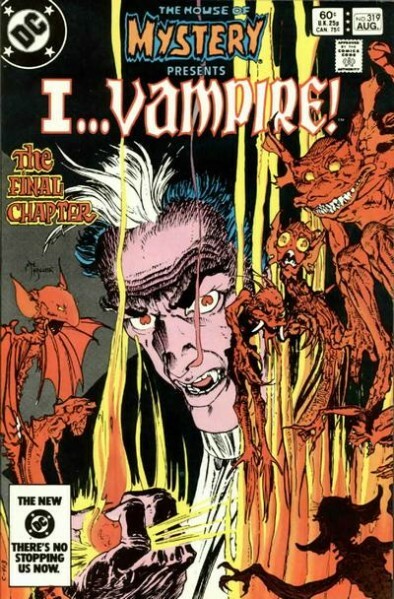 Although "I...Vampire" ended with issue #319 in 1983 and The House of Mystery soon followed with #321, fate, it seemed, was not yet done with Andrew Bennett. 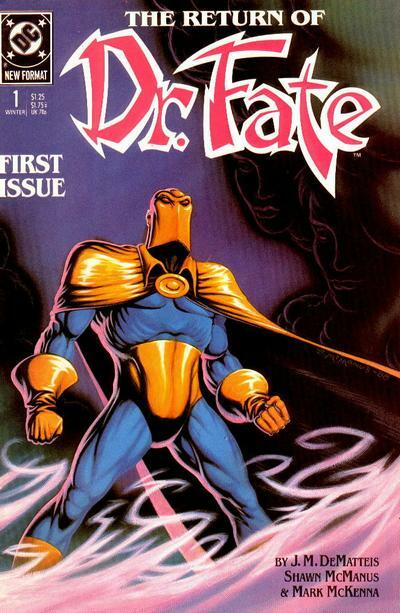 When DeMatteis united with artist Shawn McManus on a Doctor Fate series in 1988, the last-page surprise in the first issue was Bennett's shocking return! The six-issue arc dealt with his inexplicable resurrection and his attempts at redeeming himself for his tortured past. "I really liked Bennett, and his inner struggle for redemption fit right into the themes I was exploring in my first arc in the ongoing Doctor Fate series I did with Shawn McManus," offers DeMatteis. "It was a treat to return to the character and his world—I especially enjoyed the Zen monk vampires he was allied with—after something like eight years. I was also a much better writer by then, so I was able to make up for some of the clunkier scripting in my original run." Bennett's arc ended on a bittersweet note, although certainly DeMatteis left the door open to a more permanent return. "I actually pitched DC on an 'I...Vampire' revival at least once, possibly a couple of times (my memory's fuzzy on the details), but they turned me down," he says. Sadly, DC relegated him to a memory for the next two decades, only allowing him a brief string of appearances in Brian Azzarello and Cliff Chiang's idiosyncratic "Dr. Thirteen" series in the anthology Tales of the Unexpected in 2006-7. Dr. Fate encountered Andrew Bennett early in his 1988 series. McManus art. Fans of DeMatteis' original work on the series, which has stood the test of time to inspire the new incarnation, may be surprised to learn the writer did not originally consider himself a major fan of vampire fiction. "I remember reading Bram Stoker's Dracula in college and being surprised by how good it was, but the genre never drew me in any profound way. Once I started writing for the DC horror anthologies, I had to dip into vampire lore because that was a huge part of what those books did. The more I explored, the more I enjoyed the genre. As with Bennett, I saw the vampire as a wonderful symbol of the darkness inside all of us. The vampire's struggle is the universal human struggle. 'To bite...or not to bite.' When I went over to Marvel, I explored the vampire mythos, in a very different way, in my Greenberg, the Vampire graphic novel (and the Bizarre Adventures story that preceded it)—which I remain very fond of, and proud of, to this day." DeMatteis has also worked alongside artist Kent Williams on the Epic Comics miniseries Blood: A Tale, a more unusual take on vampirism. Asked for his opinion of his original "I...Vampire" tales, the author admits, "To be honest, I haven't gone back and looked at those stories in a long time. I'm sure I will once the collected edition comes out early next year. I'm sure there's a lot I would have done differently, simply because, as noted, I'm a better writer, a better storyteller, now. 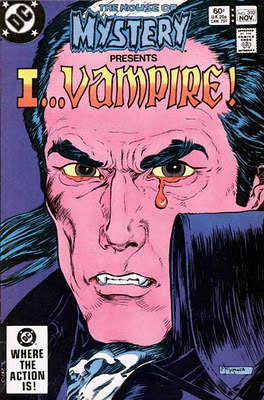 That said, 'I...Vampire' was my first original creation in comics and I poured my heart and soul into it. It was, at the time, the absolute best I could do. So, in the end, I think I should leave my younger self alone, respect him and let his work stand on its own." 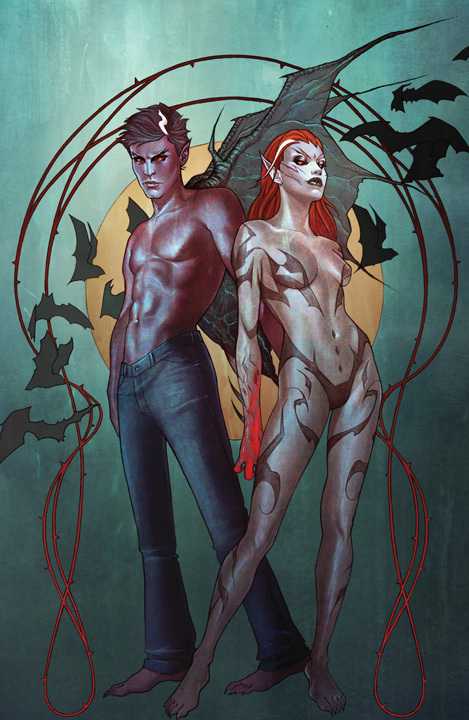 Jenny Frison illustrates the new "I, Vampire" covers. Understandably, with his wishes to bring back Andrew Bennett a few times in the intervening years, DeMatteis is proud to see his creation return in DC's "New 52" this fall. "I loved writing and creating that world and those characters and...based on the first issue of the new series, Josh Fialkov is doing a bang-up job reimagining Andrew Bennett's world. I just hope Mishkin shows up somewhere along the way!" So do we, Mr. DeMatteis. So do we. 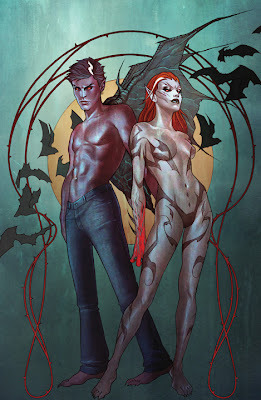 "I...Vampire" will be available in a DC Comics collected edition with a projected on-sale date of February 8, 2012. Consult your local retailer for ordering information, or order it from Amazon.com , Discount Comic Book Service or any shop you trust. Please visit writer emeritus J.M. DeMatteis on his blog, Creation Point, at jmdematteis.com! And Dan Mishkin is at danmishkin.com!